The following pages represent an ongoing conversation between, Allan Scherr and Douglas Hoffman. The subject is leadership. In this post and the ones that follow, we will be speaking about leadership both in terms of theory and in practical experience. We invite all comments and additions to the conversation. Doug: Allan, I have been reading on Linkedin, conversation after conversation, attempting to boil leadership down to its simplest elements. And while I appreciate the intention, I am amazed at times by the diversity of reply. 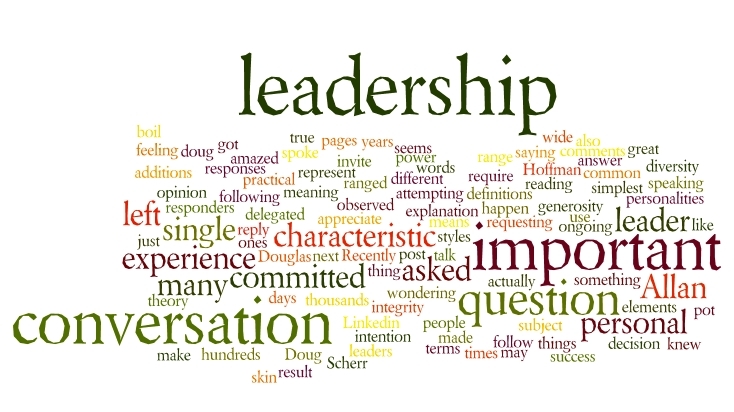 Recently the question asked was, “What is the single most important characteristic of a leader?” Over the next 10 days, this question got hundreds, if not thousands of responses. They ranged from personal power to generosity. I was left wondering what leadership means to many of the responders. I also was left feeling like it is actually a great question and the answer may require some explanation as it seems that many of us use different definitions for the same words. So, Allan, in your opinion and experience, what is the single most important characteristic of a leader? Allan: The true leaders that I have observed over the years have a wide range of personalities and leadership styles. The most important thing they all have in common is personal integrity. When they spoke, you knew that what they were saying had meaning, was important, and was not just talk. When they asked people to make things happen, you knew that they were committed to the result they were requesting. When they made a decision, you knew their skin was in the pot. When they delegated something, you knew they were committed to your success. Doug: So, in what you are saying there are several items I want to follow up on. First, you speak of integrity and I am clear that people have many different meanings for that word. Would you mind elaborating? Second, you refer to “true leaders”; what is a true leader and how can one tell? I think we need some sort of measurement for leadership in this conversation. Would it suffice to say that leaders are to be measured by two primary factors; the production of intended results and the generation of new leaders? Allan: To me, a person with integrity is one who “honors” his or her word. Meaning that when they speak, they speak with commitment. When they listen, they listen for commitment from others. They are committed to keeping their word. When others give their word to them, they are committed to the other person keeping his or her word. Finally, if and when they discover that they are unable to deliver what they committed, they communicate this fact to those concerned and clean up whatever mess is created. I agree with your take on what a true leader is: a person who produces extraordinary results and around whom new leaders emerge. There is one other critical aspect and that is that this generally occurs in the context of an organization or group. Being a leader of oneself as an individual may produce extraordinary results, but is lacking the real challenge of leadership: enrolling others to commit to be on a team whose purpose is to produce extraordinary results and leading the resulting team through the hurdles of actually producing the result. So perhaps this can be seen from the perspective “what are THEY being left with?” How this gets done tactically isn’t particularly relevant apart from the king-pin influence of personal integrity.